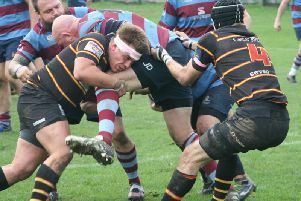 Harrogate Pythons progressed to the second round of the Yorkshire Vase with an emphatic win at Stocksbridge. 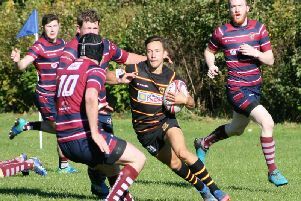 Dan Bird's in-form team ran out victorious by a 59-10 scoreline, registering their fifth consecutive triumph in the process. Playing up a steep slope, 'Gate asserted control in the tight early on and although their hosts defended valiantly, the deadlock was broken after a quarter of an hour. Ram Ismail ran a good line and collected Liam Kernoghan’s short pass before going under the posts, Jed Wolfram then converting for 7-0. Stocksbridge kicked a penalty to reduce the deficit, but with Pythons scrum-half Ned Rutty making a real nuisance of himself the away lead was soon extended. The visiting number nine's sharp pass put Kernoghan through a gap and he made the score 12-3 in the 22nd minute. A 'Gate turnover then saw Rutty collect the loose ball and race away to score by the posts, Wolfram again converting. A fourth touchdown arrived as Ian Binns secured clean line-out ball and Sandy Dunlop drove over moments before number five was added by Rutty following Jed Carr's burst through midfield. Wolfram booted over the extra two points on both occasions, meaning that the men from Station View took a 33-3 advantage into the interval. The Pythons began the second period half in confident fashion and a good run and pass from Max Sharp put Jon Pickard into a gap, Wolfram then converting once again. Stocksbridge responded with a series of pick-and-drives and eventually forced their way over for a well-deserved converted try, trimming the gap slightly at 40-10 on the hour-mark. Normal service was however resumed shortly afterwards when a home clearance was nicely taken by full-back Jake Harland. He linked well with Rutty who danced past several defenders before stepping the Stocksbridge full-back for a fine individual score, Wolfram adding the extra two points for 47-10. With 'Gate rampant, a flowing move was eventually halted five metres short, but Steve Kirkpatrick picked out the bullocking run of Nathan Wake who crashed over to take his team past the half-century mark. Wolfram's kick made it 54-10 and then, with time running out, the Pythons spread the ball from one side of the pitch to the other, creating space for Will Harland to gallop away on the outside and round things off. Next up for Bird and his troops is a home meeting with Yorkshire Three leaders Rotherham Phoenix at Station View.